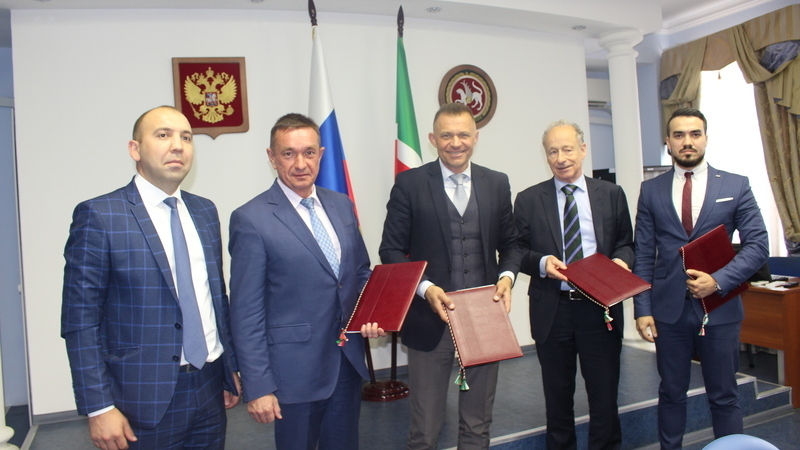 Within the framework of the three-day visit by CEO of DECHEMA Ausstellungs-GmbH Dr. Thomas Scheuring to Tatarstan, a working meeting with Deputy Minister Aleksey Savelchev took place in the Ministry of Industry and Trade of Tatarstan. Dr. Thomas Scheuring is the organiser of ACHEMA, the World Exhibition Congress on Chemical Engineering, Environmental Protection and Biotechnology. After bilateral discussions, a cooperation agreement was signed in implementation of joint exhibition projects. Signatories to the agreement were the Ministry of Industry and Trade of Tatarstan, the Society for Chemical Apparatus DECHEMA Ausstellungs-GmbH (in the person of its CEO of Dr. Thomas Scheuring), the Russian division of the German exhibition concern Messe Frankfurt GmbH, OOO Messe Frankfurt RUS (in the person of its Head of Representative Office Denis Ryaboy), and the Kazanskaya Yarmarka. According to the signed agreement, the parties agreed to render assistance in the implementation of joint projects by providing methodological, organisational, expert, analytical, and information support.